NOBL = ProShares S&P 500 Dividend Aristocrats. SPY = SPDR S&P 500 ETF. VB = Vanguard Small-Cap ETF. NOBL data by YCharts. In the short run, it's possible for Dividend Aristocrats -- about 50 S&P 500 companies that have increased dividends every year for the last 25 consecutive years -- to continue to underperform as yields on fixed income continue to push higher, making dividend stocks less attractive to investors. In the long run, however, it's clear that dividends are an important driver of stock returns. In fact, a white paper from Capstone Financial found dividends were responsible for one-third of the S&P 500's total return since 1956 and that a portfolio of reinvested dividends would be nearly double the index's return because of the power of compounding. 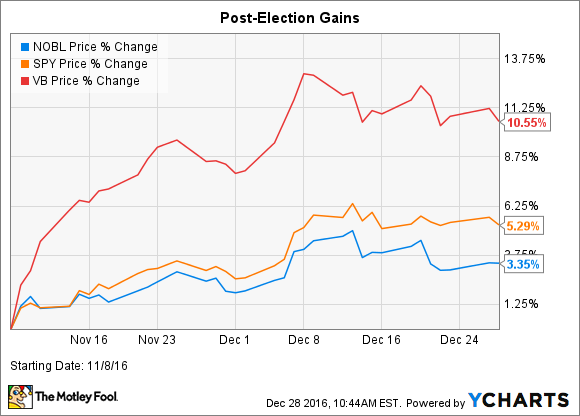 With that in mind, we asked three Motley Fool contributors to each name a Dividend Aristocrat to buy in January. Read on to see what they have to say about Johnson & Johnson (NYSE:JNJ), McDonald's (NYSE:MCD), and AT&T (NYSE:T). George Budwell (Johnson & Johnson): When it comes to delivering top-notch growth and passive income for investors, healthcare giant Johnson & Johnson is simply unmatched within its peer group. The company, after all, is set to generate its 33rd year of consecutive adjusted earnings increases and raise its dividend for a 55th year in a row. Apart from its regular dividend increases and sustainable growth, though, J&J seems primed to benefit from the incoming president's proposed policy shifts toward corporate taxes and the FDA. In a nutshell, Trump's proposed tax plan, calling for a 15% corporate tax rate, would positively affect J&J's effective tax rate that has hovered around 20% over the past few years -- freeing up additional cash for value-creating activities such as a special dividend or perhaps more acquisitions. Additionally, Trump's desire to enact reforms within the FDA that would bring life-saving medicines to patients faster is welcome news to top innovators like J&J that spend a hefty percentage of their annual revenue on research and development. In short, Trump's administration may push reforms through that would significantly lower the average development time by essentially doing away with the requirement that drugs are proven to be effective before approval. If such radical regulatory reforms made it through Congress, J&J would be able turn around and file literally dozens of New Drug Applications within a matter of months. All told, J&J has a lot to gain from a Trump presidency that seems willing to break with tradition on the corporate tax issue and the FDA's role as a gatekeeper for new medicines. Tim Green (McDonald's): Global fast-food giant McDonald's is doing what needs to be done to remain relevant. With consumers increasingly clamoring for food without artificial ingredients, and made with animal products produced humanely, McDonald's is slowly but surely moving in that direction. The company announced in late 2015 that it planned to fully transition to cage-free eggs over the next decade. A few months ago, McDonald's unveiled plans to remove artificial ingredients from roughly half of its menu, including Chicken McNuggets and McGriddles. Its buns will no longer contain high-fructose corn syrup, and the company has committed to serving only chicken raised without antibiotics. McDonald's willingness to make major changes is a sign that management realizes that it can no longer ignore its customers. These initiatives, along with the introduction of all-day breakfast, have helped McDonald's return to comparable sales growth. Earnings are growing even faster, driven by higher restaurant profitability and the company's refranchising efforts. For dividend investors, this means McDonald's dividend has the potential to grow. McDonald's has paid a dividend since 1976, raising that dividend every year without fail. Sales and earnings growth will be required to keep this policy intact going forward. With McDonald's putting up strong numbers once again, the stock's 3.05% dividend yield looks like an enticing proposition for dividend investors. Jamal Carnette, CFA (AT&T): Although the Patient Protection and Affordable Care Act, aka Obamacare, and Dodd-Frank legislation receive more media coverage, the Federal Communications Commission was perhaps the most persistent pro-consumer regulator in President Obama's administration. Chairman Tom Wheeler enforced net neutrality, dealt the death blow to the Time Warner Cable/Comcast merger, and took steps to inject competition in the $20 billion set-top-box market. These moves earned praise for Wheeler from consumer advocates but intense ire from the industry. When Wheeler steps down on Jan. 20, then-President Trump will have a Republican majority to reverse many of Wheeler's rules. While not exactly a zero-sum proposition, AT&T should benefit from the FCC's about-face while consumers are faced with less-friendly rules. Importantly for investors, AT&T appears to be a winner under the rough draft of the nascent House Republican tax plan. As detailed in The Wall Street Journal (subscription required), the plan calls for reducing the 35% top rate to 20%. Many businesses may not benefit from this decrease, since they pay much lower than the stated rate, but AT&T's effective rate last fiscal year was 33.9%. Additionally, the House plan pits exporters against importers by not taxing foreign earnings, and AT&T's Latin American DIRECTV holdings and Mexican wireless operations should enrich investors nearly tax free. AT&T's not a perfect investment: The company has a high debt load and primarily operates in the increasingly competitive wireless industry. However, the company has been around as long as the telephone itself and is in no danger of collapsing now. Lower taxes and a business-friendly environment should provide a tailwind for returns even if income stocks are currently out of favor.